Lawmakers are now probing a deal to rent helicopters to Uganda. It has Atambayev’s fingerprints all over it. 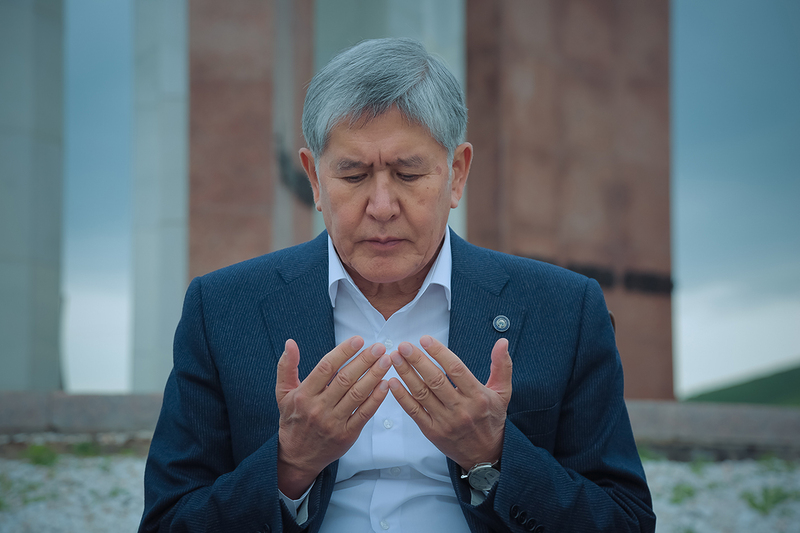 Over the six years in which he ran Kyrgyzstan, former President Almazbek Atambayev made enemies left and right, paying little heed for the consequences. Now that he is out of power, his often abrasive and arbitrary style of rule is returning to haunt him. Atambayev, 61, has had a torrid few months. Many allies installed by him in powerful government posts have been fired in a systematic purge waged by his successor-turned-foe. Some have been arrested. And now another scandal is looming. Since last week, lawmakers have begun demanding a renewed probe into the nebulous circumstances under which Kyrgyzstan planned in 2014 to rent out four military helicopters to Uganda’s armed forces. The person fanning the flames of the scandal was once fired by Atambayev and was later investigated on corruption charges. What is known so far is that Kyrgyzstan proposed to lease two MI-24Bs and two MI-8MTBs donated to it by Russia to Uganda for use in peacekeeping operations in Somalia. Deputies in parliament want to understand how the deal was hatched. The contract was reportedly signed by representatives of the Ugandan defense ministry and the state-owned Kyrgyzkural weapons enterprise in December 2014, but the public only learned about it many months afterward. Even then, the affair only came to light by virtue of a petition from then-Defense Minister Abdilla Kudaiberdiyev for prosecutors to investigate whether the deal was even legal. Under the terms of the agreement, lease payments were to be made to the Dubai-based bank accounts of a company called Sky Tech Trading Services FZE. It is unclear whether the Kyrgyz state would have been the ultimate beneficiary of the transaction. After Kudaiberdiyev made a stink, a government-appointed interdepartmental working group in September 2015 decreed that the helicopter lease indeed did “not correspond to the requirements of Kyrgyzstan’s existing legislation.” In other words, whoever pushed through the contract may have broken the law. And as chance would have it, a copy of the government decree on the lease, dated October 8, 2014, and bearing Atambayev’s signature has suddenly come to light, courtesy of RFE/RL’s Kyrgyz service, Radio Azattyk. Kudaiberdiyev clearly has an axe to grind. In October 2015, the helicopter affair having died down, he was fired by Atambayev. His dismissal came on the heels of prosecutor filing charges against him on suspicion of corrupt schemes within the ministry. He is now relishing the opportunity to get back. “To sign [a contract] between two states it was a requirement to get permission from the government of Kyrgyzstan. But that didn’t happen. [Atambayev] unilaterally broke the law and signed the agreement,” Kudaiberdiyev told Radio Azattyk last week. A particularly piquant aspect of this story is the notion that Atambayev might be seen as having betrayed the confidence of his fastest allies in Moscow. Atambayev’s only remnant source of formal political influence is his Social Democratic Party of Kyrgyzstan, or SPDK, which holds the largest bloc of seats in parliament. It is not easy to understand quite why Atambayev’s successor, Sooronbai Jeenbekov, is proving so ferocious in hounding his one-time ally. The most prevalent and convincing explanation is that Jeenbekov, who was elected to power in October and inaugurated as head of state in November, has bristled at the prospect of having Atambayev hanging around as a back-seat president. Atambayev signaled his intentions on that front at the end of March when he retook the helm of the SDPK, a party he was originally instrumental in founding. But he may have overlooked the fact that the power of that party was contingent on negotiated settlements with local powerbrokers. And while in the top seat, Atambayev may have forgotten the value of teamwork. Indeed, the SDPK’s representatives in parliament have proven a fickle source of support of late. The vote of no-confidence that culminated the ouster of Sapar Isakov, an arch Atambayev-ite, as prime minister in April was put forward by opposition deputies but was eventually supported in parliament by many SDPK members. “Yesterday’s decision to arrest civil servants who clearly documented the extent of theft in the customs system is in fact revenge being meted out by the friends and patrons of the famous Rayim Million, whose dismissal led to positive changes and sharp increase in customs revenues,” Atambayev said. That was an impossibly bland way to describe the sudden fall from grace for such a powerful individual. Matraimov is a consummate operator and a highly recognizable power-broker in his native south. His nickname, which local media uses liberally, is an allusion to the kinds of riches that high-ranking customs officials in Kyrgyzstan are said to acquire. Atambayev does not spell it out, but Matraimov’s ability to wreak revenge against the former president’s entourage is contingent in part on the political support he is said to have lent the SDPK over the years. Crossing Matraimov was never going to go well. Atambayev is still protected by the privilege of immunity as a former head of state, but the emboldened parliament has been talking of scrapping that legal protection. As Medet Tiulegenov, a professor of international and comparative politics at Bishkek’s American University of Central Asia, told Eurasianet, Jeenbekov has many people in his entourage bearing grudges against Atambayev. And with his legacy of six years in power, there may be a surfeit of suspect transactions implicating Atambayev like the one of the helicopters to Uganda. “Considered against the background of general trends, this is one of those stark cases that could have not just internal implication but also international ones,” said Tiulegenov.